Shole-Zard is a creamy rice pudding infused with saffron, rose water, cardamom and cinnamon. Almonds are added to it for textural crunch and pistachios for adornment. Saffron, sugar, cinnamon, cardamom, butter, rice, almonds, pistachios, all the very good things in life, in one dish. 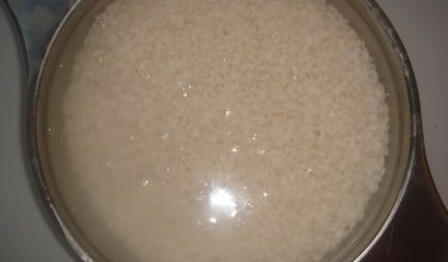 Wash the Basmati in cold water 6 times till the milky water begins to run clear and soak for 1 hour. In the meanwhile, take 1 tsp of the saffron threads and crush with a pestle & mortar or back of a spoon in a small bowl. 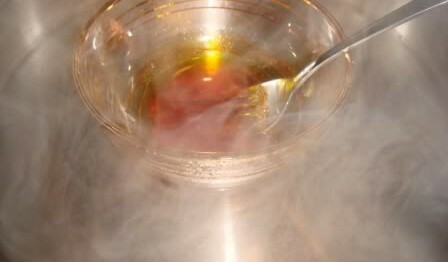 To this mixture, add ½ tsp of whole threads and 1 tbsp of warm water. Set aside. Add the Basmati to a pot with 4 cups of cold water on the lowest heat. Let the Basmati simmer for 30 minutes till you see it has cooked and moistened and the water has almost evaporated. To the moistened rice, add sugar mixed in hot water, rose water, butter, a cinnamon stick, almonds, cardamom seeds and the saffron infused liquid and stir gently. Cover and let cook for another 20 minutes. You will have to stir it occasionally, but gently, to ensure the rice is not sticking to the bottom of the pot. Uncover the lid and cook for another 20 minutes. Remove and discard the cinnamon stick and ladle pudding into 4 individual cups.